3 BR (inc Sleep Cabin); Sleeps 6 Adults, 2 Children; Beach, Private, Lovely! 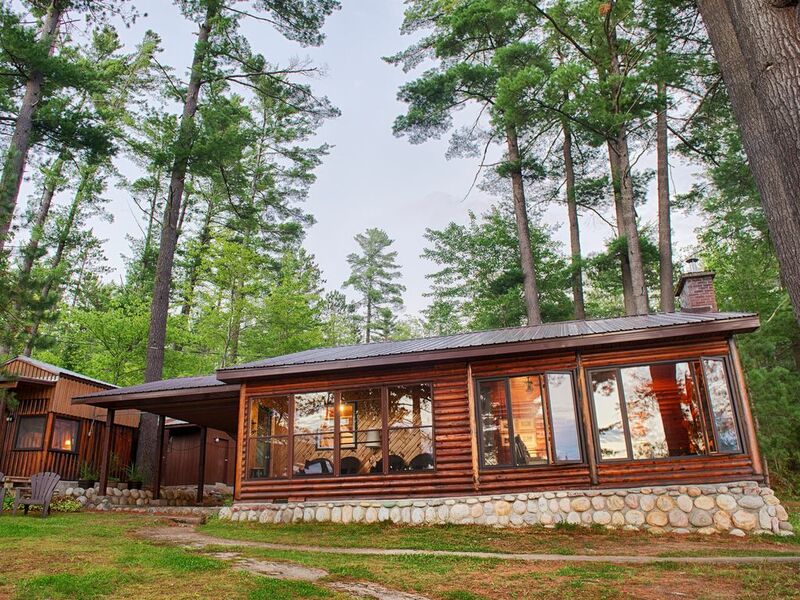 A wonderful beach front, southern exposure log cabin nestled among majestic white pine. Watch the mist rise, listen to the loons, and have your coffee on the dock. Canoe or kayak along the historic Mattawa River (Lake Chantplein). Read a book or swim. Roast marshmallows and watch the stars sparkle almost within your reach. Hike to town for a great meal at The Moon or Voyageur Inn or BBQ in the outdoor summer kitchen. It’s up to you. WiFi, Netflix and lots of board games. Great romantic setting for couples or plenty of room for the whole family or a group of friends (sleeps up to 8 - 6 adults and 2 children- in 3 bedrooms including a sleep cabin). The main cottage has a great room with a wall of windows overlooking Lake Chantplein (part of the Mattawa River Heritage Waterway). Renovated washroom with shower, full kitchen, drilled well, sun porch, propane fireplace for heat and ambiance, carport, good cell service and WiFi. The Town of Mattawa is 5 kilometres (3 miles) away with grocery stores, pharmacy, hospital and more. Visit the Mattawa and District Museum, 20 Historic Statues, the Clermont Duval Art Gallery and many other small-town treasures. Try golfing at the Mattawa Golf ‘n Ski Resort or take a guided nature hike at Samuel de Champlain Provincial Park. Or, simply enjoy the cottage - it’s your holiday! We've loved this log cottage for years and when the owners decided to sell their much loved summer home, we were blessed to buy it for our children. It's still a few years away before they will use it, so we are renting it out so that it will still be enjoyed. One year, we spent Christmas day there as an ongoing tradition and we can't imagine a more perfect setting. What a treat! A wonderful family occasion with a roaring fire, board games, laughs and hot chocolate! Nature at her best, white majestic pines, clean lake/river, privacy yet not far from town, swimming, canoeing, kayaking, fishing, peace & quiet, marshmallow roast, BBQ, history, museum, art gallery, hiking trails, good & inexpensive golf. And we could go on! Renovated bathroom with walk-in shower. Propane fireplace, electric heaters in bedrooms and living room and bathroom, and a portable electric heater in the separate sleep cabin. Large living area - seats 8 easily. Separate screened/glassed-in porch - seats 4 very comfortably. 1 canoe, 2 kayaks, paddles and life jackets. Covered summer kitchen for bbq and picnic table. Rogers and Bell cell towers are in the area and service is good. Beautiful well appointed accomodations with all the comforts of home! Everything you could want or need is here for you when you arrive at this beautiful log cottage. From the welcome basket to the well stocked kitchen, to the comfortable beds and linens, we immediately felt at home. The beach and dock provided the perfect spot for a bonfire or launch to use the canoe or kayak. Close access to the historical Ottawa and Mattawa rivers, great hiking and lots of opportunity to enjoy nature created a perfect opportunity to recharge on our vacation. Tina was excellent in responding to any questions we had and was a pleasure to deal with. 5 stars and highly recommend this property! A sincere thank you for your review! I think of the cottage as a welcoming home and am so glad it made you happy! A lovely cottage in a beautiful setting with total privacy. What a treat for this California family. And the owner is incredibly responsive and caring. Book it if you can. I had to book it a year in advance. Glad I did. A beautiful, quiet spot to get away. Those who have rented properties before will appreciate the well stocked cottage and thoughtful amenities provided by the hosts. Glad you enjoyed your stay. Have a lovely remainder of summer! Beautiful log cabin sums it up! We were a party of five...one senior, twins aged 8 and their parents. Blessed with superb weather we swam,kayaked and canoed our way through the week, ate every meal outside under the shade of the outside kitchen roof, toasted marshmallows over the bbq (there was a fire advisory limiting open fires... as ther was over much of Ontario...but not a whiff of smoke) and made good use of the bbq for meals. We completed our obligatory three jigsaws (family imposed!). We had one visit to Samuel de Champlain Provincial Park (through town about 10 minutes)...they have some great kids activities and we were lucky enough to be able to do the Voyageur canoe re-enactment... great fun! In summary, we had a great time, the cottage facilities are wonderful and we didn’t miss the dishwasher or washer/dryer! Wonderful vacation in lovely Tina's cottage ! Our vacation in Mattawan was perfect ! Tina's cottage was awesome to spend wonderful time outside and inside. Our two daughters (under 3 years old) had great play-time on the private beach... It made the older one love to go in the water, which is extraordinary ! The guest house has been occupied by a friend all week, and he seemed to have the perfect set-up to ''sleep in the wilderness'' of Mattawan. Everything was just perfect. Thank you again ! So glad your stay was great! Hubby and I are thrilled that your little girls had a safe and fun time. Thanks for the review. Hope to host you again one day! Tina and family. The cabin was so well equipped and clean. We were very impressed. So much so that we have booked for next year already. 3 night minimum stay. Weekends -Thursday, Friday, Saturday & Sunday. Victoria Day, July 1, 1st Monday in August & Labour Day are "weekend days". A refundable $500 security deposit upon booking is charged. If any damage or broken rules i.e., no pet rule or no smoking rules, then the full $500 is taken from this deposit. $150 cleaning fee. Extra cost for over 4 people - $25 pp per night.